The Medical College Admission Test (MCAT) is a computer-based test that medical colleges request as part of their application. In other words, you cannot enter medical college without taking the MCAT. However, sometimes life happens and you may be going through a tough time and cannot present the test, or you got a low MCAT score. If this is your case, you don’t have to worry about anything. A waiver letter can help you. 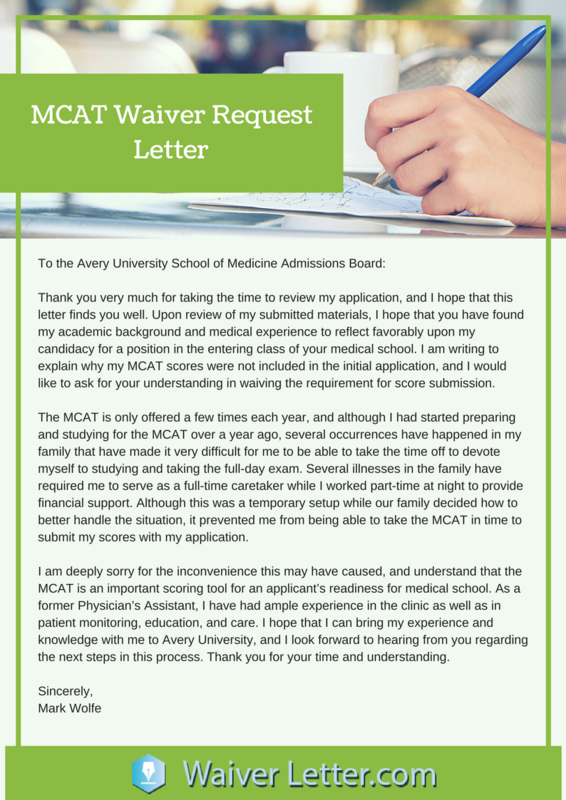 Writing an MCAT waiver letter requesting the admission board to waiver your MCAT requirement is a common practice among students with low scores. Or you can also need to write one if you or your family are going through a difficult financial situation and cannot pay the MCAT fee. In this case, you will have to write a fee waiver letter. Do you want to write an MCAT waiver letter? If so, you have come to the right post that will share you the tips on how to come up with one. First, let know that the MCAT is developed for medical school admissions, and such is taken by applicants in order that the admissions committee can verify a student’s problem solving, knowledge of scientific principles and concepts and critical thinking skills. Now if you want to write a waiver letter of request, there are some pointers you have to know. Check them out. What is an MCAT waiver request letter? It is a type of written request where you formally ask for a waiver. In this case, you will be requesting a waiver on your MCAT score or fee. How should I write a waiver letter? You should always write it in plain language. You need to be sure the reader understands your requirement. What is an MCAT registration fee waiver? It is when you ask for a reduction of the MCAT fee – in other words, is when you ask for a discount on the price or to take the test for free because you are going through a hard financial situation. 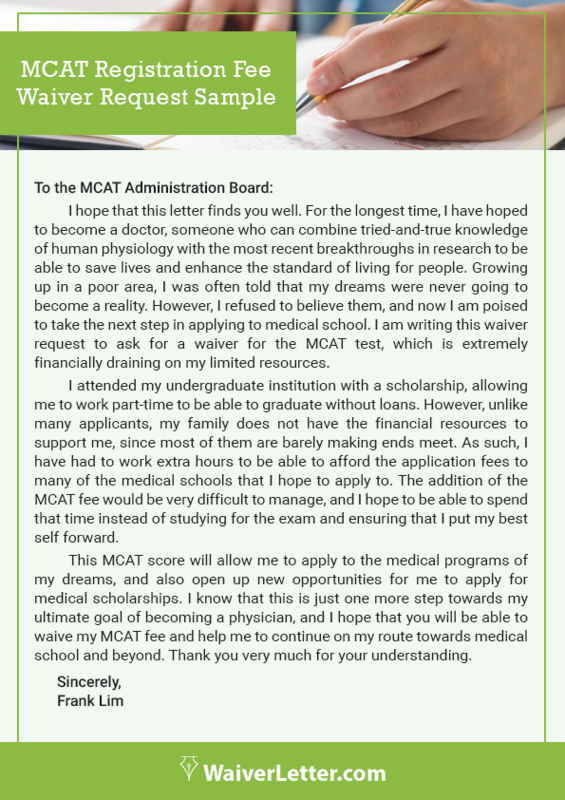 What is the purpose of the MCAT waiver letter? The purpose of this type of letter is to request a waiver via a formal written communication. What format should I use for my waiver letter? You should use a basic structure of four paragraphs where you briefly explain why you are requesting a waiver and include any proofs to support your arguments. While the admissions committee requires your MCAT scores, even if it is low MCAT, you can waive this requirement if allowed in the institution you are applying to; however, you should know that not all medical schools allow it. And if it allowed, remember that you may need an adequate GPA of an average 3.0 before you can be approved of a waiver. This is not the only condition though because some schools may still not allow it. In some cases, you can attempt that the MCAT requirement is waived if you are holding a professional doctorate degree from a recognized institution or if you are applying after your master’s degree. There are other programs that can allow an MCAT waiver provided that the applicant has received enough results on an exam version over five years old. You should know there are some secrets you can use if you are writing MCAT waiver letter. Reading a well-written waiver letter example has many benefits. You can look for one online or check one of our examples. An MCAT waiver sample will help you with your writing. Why? Because you can use it as a template. A well-written letter will use persuasive sentences linked coherently to one another. Thus, you can copy them and use them as a guide when you are writing your waiver letter. An MCAT waiver letter sample can also help you to see how the writers include the evidence in the text. In a waiver letter, you cannot write “P.S. See the attached documents at the end.” You have to explain what sort of evidence you are including and why. Thus, a sample can help you do it. Plus, using a sample will help you save time with your writing. If you are writing an MCAT waiver letter you should know there are certain requirements you need to meet. For starters, you cannot write a waiver because you had a party and you got a low score on your MCAT. A waiver letter is a serious written request, and as such, you should treat it with respect. Another requirement is that you need to provide substantial evidence. If you say that you were terribly sick and that affected your performance, you need to include a medical certificate to back your story up. Otherwise, the reader will have a hard time deciding if you are telling the truth or not. If you are writing a waiver letter to ask for a waiver fee, you will need to gather and include any substantial evidence you think may help you with your case. However, do not send original documents. Instead, attach hard copies to your waiver letter as proof. Detail your professional and academic experience, including research areas and relevant industries where you have worked in the last five years at least, which will help in demonstrating your preparation for graduate study alongside your quantitative and verbal abilities. The letter must include your waiver request form, if needed, together with copies of your official records, resume, certifications, and licenses to support professional credentials. Finally, proofread and edit your letter to ensure it contains no grammar and spelling mistakes. An amazing LSAT waiver letter help is finally here! There you have our tips on how to create an effective MCAT waiver letter to submit along with your requirements when applying for a medical school. Keep them in mind and apply them to your letter for the best results. Our writers can compose MCAT waiver letter through proper proofreading and editing of your work. We’ve come up with extra expertise to live up to your expectations. Well, we have dependable and professional writers on board the team who’re all diploma holders at fees that are properly within your method. We take into account that your waiver is valuable for your destiny in particular whilst there are a few restrictions that you may virtually do without. Quality is the major thing we put a detailed focus on. We edit the writing pieces as per the requirements of the clients. The text content is checked multiple times. The guarantee of refunding money is also given by us. We can deliver the MCAT waiver letter writing assignments within a certain deadline. You won’t have to ask even the single time about a delivery of the task. The brief letters are written that sound meaningful. If you experience any difficulties, we can easily help with your MCAT waiver letter!